Several students in the Department of Epidemiology and Population Health presented at the Society for Epidemiologic Research (SER) and Society for Pediatric and Perinatal Epidemiologic Research (SPER) annual meetings held in Baltimore, MD in June 2018. 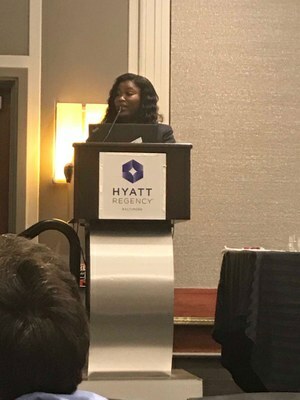 Doctoral candidate, Islamiat Oladipupo, MBBS, MPH, presented “Association between Smoking and Ovarian Reserve Among Females Seeking Fertility Treatment, and Interaction with N- Acetyltransferase 2(NAT2) Genotype” during a SPER plenary session on June 19. Fellow student T’shura Ali was a co-author on this presentation along with Henry Bohler, Kelly Pagidas, David W. Hein, Merry Lynn Mann, Adrienne Gentry, Yelena Dondik, Jasmine Chiang, and Kira C. Taylor. Recent graduate, Delvon T. Mattingly, MS, presented posters on his research project, "Tobacco use and communication channel preferences among Appalachian youth," at both SER and SPER. His co-authors were Lindsay K. Tompkins, Jayesh Rai, Clara G. Sears, Kandi L. Walker, and Joy L. Hart. Doctoral candidate, Jack Pfeiffer, MS, presented the poster "Coal fly ash and asthma among children 6-14 years old" at SER. His co-authors were Barbara Polivka, PhD, Lonnie Sears, PhD, and Kristina Zierold, PhD.